As opposed to the bustling scenes of Edgartown, Oak Bluffs and Vineyard Haven, where Hollywood and politics play first score, Menemsha is home to the fishing fleet and the local folks who call this island home year round. A picturesque village if you are attuned to the vibrancy of lobster pots, nets, and work boats, the lifeblood of the residents, Menemsha is the place to relax, take it easy, visit the beach, go for a swim, or do a little fishing. It is not the place for glam and glitz. It's a real town where real people congregate around the fresh catch of the day. Menemsha is a fishing paradise, known around the world for its strong tides and clean water teeming with tasty bonito, feisty bluefish, and monster striped bass. Many world record fish have been caught off the Menemsha jetty and years of conservation are paying off in high numbers of large fish landed here. 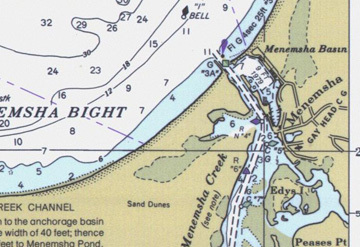 Menemsha beach is in the middle of the legendary crescent between Dogfish Bar and the Brickyard. For many a surfcaster and flyfisher there is no other place on earth to be on an October night. They know that here their next cast may well produce that legendary fifty pounder. The 300 year old fishing port is home to a charter fleet captained by experienced and colorful local guides who will put you over big fish on full or half day charters. Shore guides are also available to teach you saltwater flyfishing. Many visitors return each autumn to compete in the famous Martha's Vineyard Striped Bass & Bluefish Derby. The beach right off the harbor. There are moorings all along the beachfront. Menemsha Pond is a popular destination for kayakers, and rentals are readily available. There is antique hunting close by as well as shops, galleries and such traditional happenings as the Chilmark Flea Market. Chilmark's famous private ocean beach, Lucy Vincent, and Squibnocket are two places to relax nearby. Scenic country roads and thousands of acres of conservation land are close by for hiking, biking, and bird watching. Horseback riding, and two excellent public golf courses are also nearby. Having a bike available is useful here as we did not see any opportunity for rentals. As to eateries, the Bite is a family style restaurant concentrating on seafood (BYOB) on the Basin Road with outdoor seating (~$10 average per entree). Beach Plum is a romantic, fine dining facility with great views that serves French dominated by seafood (BYOB). Expect the average entrée to cost over $40, and patrons dress casual but fashionable. Two additional options are the Homeport (upscale seafood) and Menemsha Galley (burgers and dogs) on North Road. Locally caught seafood is available at Larson Seafood Market. There you can get local clams - steamers, littlenecks, cherry stones and quahogs are available raw or cooked. Larson's also has home made chowda and local seafood cooked or raw to go. So you can eat on the rocks, the beach or back on your boat (our personal preference). Prices are very reasonable to cheap. Overview of the harbor. Sailboats rafted up on the few available moorings in the pond. 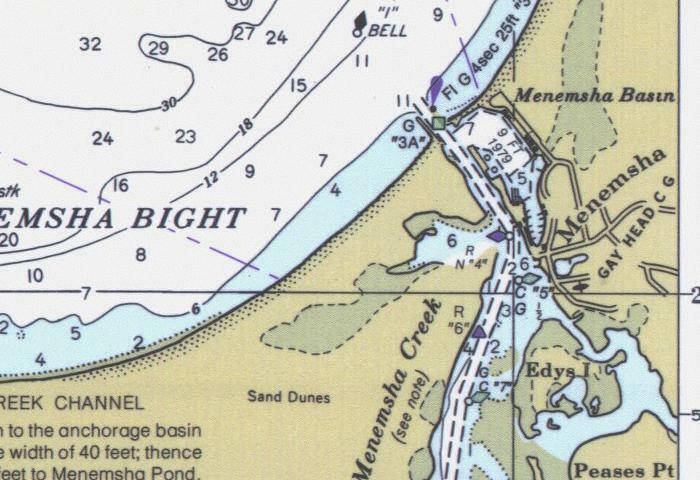 Menemsha is a tight harbor with few moorings for sailboats and no overnight anchorage permitted inside. There are some transient slips (16 slips and a float at the north end of the harbor for boats up to 50 feet LOA) and the daily rental fees are $2.50/foot for LOA plus $5.00/day for 30 amp and $10/day for 50 amp electrical service. The fee and fine schedule for Chilmark does not include a mooring rental fee. Transient visitors can stay no longer than 14 days. 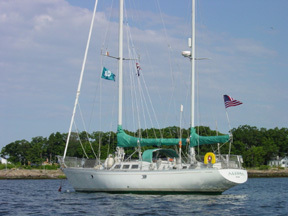 There are 2 sailboat moorings inside Menemsha inner harbor available for $30 per night. One is required to accept rafting sailboats maximum is 4 per mooring. Moorings are also available east and west side of the harbor entrance. There are two rows on the east side and one row of moorings on the west side. The moorings are free for use during the day. Over night stay is $20. Holding is good in the vicinity of the moorings and people do anchor here. You might not want to get caught in a blow out there though, as the mooring field is quite exposed to the north and northeast. There is also a bulkhead north of the fuel docks at Dutcher Dock that provides transient dockage for visitors and unloading space for commercial fishermen; the maximum stay is 24 hours and maximum length of boat 50 feet. The Commercial Channel Dock (150 feet along the west and north ends of Filled Dock) is intended for use by fishermen but may be used for transient boats up to 75 feet LOA at the discretion of the Harbormaster if available. The floating dock at Quitsa Pond Landing is for loading and unloading from moored boats. Do not leave dinghies tied to the face of the float or you will be fined. You may tie up "temporarily" to the back of the float. To view the Chilmark Waterways Rules & Regulations for 2008, please click here. Note that the no wake zone includes all of the harbor and maximum speed is 4 knots or headway. Looking out of Menemsha Harbor through the breakwater.